7 Amazing Tricks To Cover Up Acne And Its Marks! Covering up acne and acne marks can be a task. To help you do it properly, we’ve compiled a list of 7 easy makeup tricks that you must follow! Wash your face before you begin putting on makeup so that you have a clean slate to work with. After that, apply a primer on your face. This is a step that people often forget or simply don’t do. But applying a primer is very important because it has a silicone base that evens out the texture of the skin and fills in any lines and bumps that you may have. We love this one by L’Oreal for its lightweight texture. After you’ve applied a primer, you’ll realize that hiding acne and acne scars becomes much easier! If you put on your foundation after you’ve put on the concealer, chances are that you will wipe away a lot of the concealer. To avoid this, simply put on your foundation before the concealer. And make sure you use a foundation that matches your skin tone as closely as possible. A foundation that is too light can make your acne stand out more. To get as natural a finish as possible, use a tissue paper to blot excessive makeup off. This will also help set your makeup better. 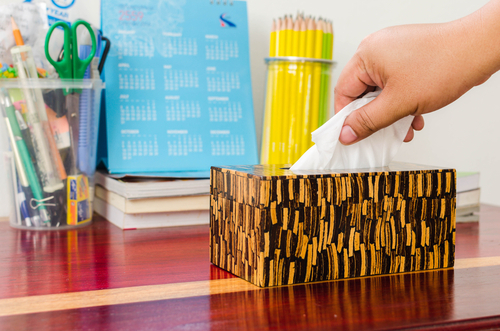 A clean base makes it easier to cover acne up, so take a tissue and pat it gently on your face. The correct way to apply concealer is in a criss-cross motion on the acne marks. Make a small cross or an X with the concealer on top of the acne marks and dab it in with your clean fingers. Make sure that your fingers are clean before you do this, you don’t want the oil and dirt from your hands being transferred to your face. That can make your acne problem worse! A corrector or a correcting cream is different from a concealer. Correctors come in different colours like green, purple or yellow and help in, well, correcting flaws like dark circles and redness. If you have redness on your face due to acne, use a green corrector on it. It will help in neutralizing the redness. You can try out this one by MUA. You’re using a lot of products on your face. This can make your makeup look cakey and make the acne stand out even more! To avoid this, make sure that you use a silicone-base primer and that your foundation is suited to your skin type (and not just color). For oily skin, a mineral foundation works best. Never go out without setting your makeup with a finishing powder. 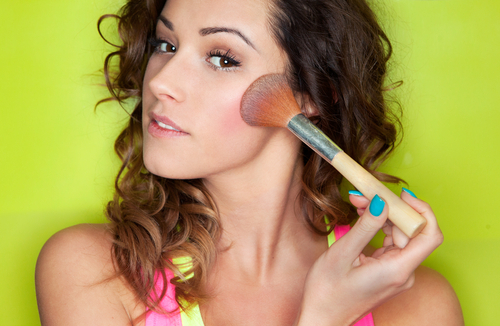 Apply finishing powder on your face so your makeup stays on and your acne remains covered longer. Use a makeup brush to blend the powder in well and conceal any remaining marks and you’re good to go! Images: Shutterstock HAVE A STORY IDEA FOR POPxo? If you want to hear about it, we can write about it! Just tell us your idea here! MUST-READ: The Simplest Ways To Deal With Acne, Oiliness & Other Skin Woes! MUST-READ: This Is The Best Makeup To Use For Acne Prone Skin!